This Saturday featured the GreenParty (organised by YOFF). I knew beforehand I would not be able to go out that day, so when the Friday became available (no work or family obligations) I decided to use the time to go /P. Scanning the list of most wanted parks I selected two in the northern part of the Netherlands: PAFF-029 De Velden (Drenthe) and PAFF-001 Alde Feanen (Friesland). Both are about 1,5 hours drive from my home and about 1 hour drive distance from each other. A lot of driving, but with a full day available that was quite acceptable. My plan would depend on the propagation conditions. If they were lousy, I planned to quit after one activity. If they were mediocre to good I would do two activities. Checking the solar widget in the morning really brought disappointment: all band conditions were predicted to be "poor". With a high A and K and low SSN, I was in for a challenge. 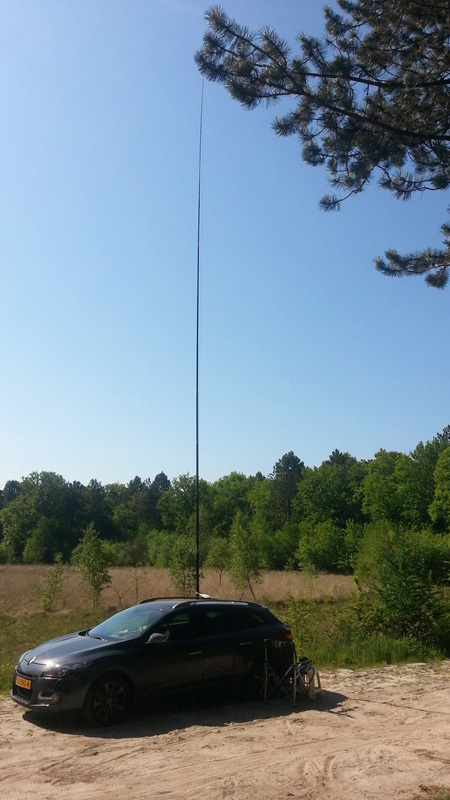 Although I did not know if I would be able to use it, I brought my hexbeam plus alu mast just to be sure I would be able to work at least some stations. 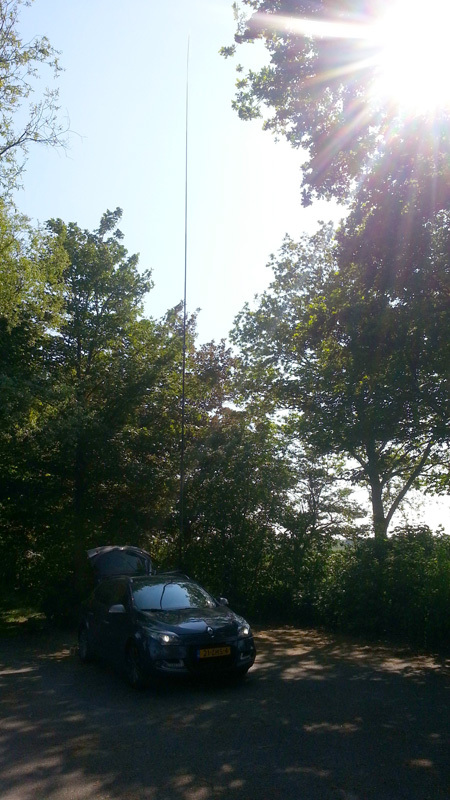 I started at De Velden (PAFF-029) on 20m with my end fed set up vertically. I did not bother to check the higher bands - my cluster app told me that the prediction was quite accurate: no activity above 20m. The first 90 minutes brought mainly EU contacts between 55-59 with a lot of stations around 57. I would guess most stations were about 2 s-units down from their usual strength. Only three stations outside of Europe came by in that period: UA9, UN and 7X. Then Rick VO1SA came by, showing at least some opening towards NA (he was in the end the only NA station I copied - and quite close by with only 4100km between us). Surprisingly also FY came by a couple of minutes later. He set the record at PAFF-029. After 2 hours of operating things started to slow down and I decided to set up my hexbeam - in hindsight probably only to give me the feeling I did not bring the antenna and the mast in vain. I still had some fixing to do after dropping the beam (for a second time...) last Wednesday. After about an hour of working in the hot sun I listened around to find that all bands were really dead. I did work one EA on 6m and I logged an E7FF operation by three OK operators on 20m - bringing the total amount of contacts to 144. Then I took everything down again leaving just enough time to drive to Alde Feanen (PAFF-001). Results were good enough to try another park. Here I found a place in the shadow - convenient as it was one of the first warm days. Being in the shadow does limit the usability of the hexbeam (not fond of trees), so I took my 20m end fed out again. Conditions seemed the same as in the morning, maybe just slightly better. I again logged mostly EU stations the first 90 minutes with the exception of one UA9, UK8 and Malkiel 4X4JU who boomed in with his new beam. When 20m slowed down I decided to try 15m as the cluster showed at least some activity. In 20 minutes I only logged 7 contacts, bringing the total in this park to 128. There were however three DX stations amongst them: A4 (new band) and 2xYC (max. QRB for the day: 11.300km). I also spoke to a G0 station and found out later that he was the first G station I contacted on 15m. Evidently not a regular skip distance for this band. Even though conditions were lousy I did log 272 calls and scored three "new band slots", for A4, G and ZB. That does not happen often - not even when conditions are great. So driving the long end home I was pleased with a day well spent.